This is a card that nearly didn't happen! 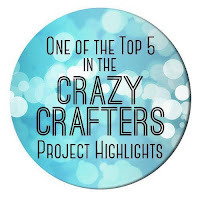 Now it's entered into the Crazy Crafters Project Highlights. 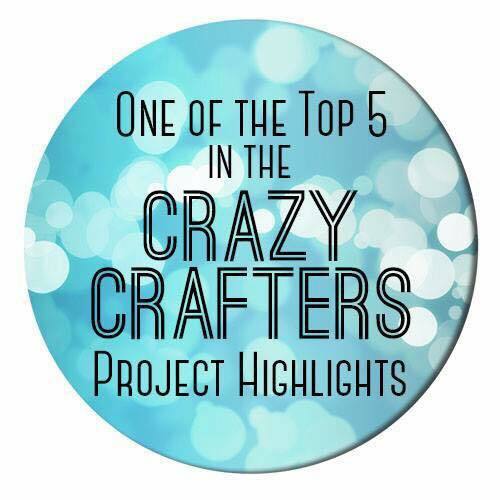 Visit here to see all the great projects and vote for your favourites. While teaching a class about masking: different types, various uses etc, I tore a little piece of paper and sponged with the ink that happened to be open on the table at the time - Soft Sky - to demonstrate how masking and sponging can be used to create a horizon line or range of mountains. Tidying up after the class, I initially swept the little sample into the bin with all the other bits of rubbish. However, it looked up at me reproachfully and seemed to say "Rescue me and give me a purpose"! So this is the finished card. It has a masculine feel and is multi-purpose. It could be seen as a painting on a wall or a scene from a window, depending on one's point of view or purpose. 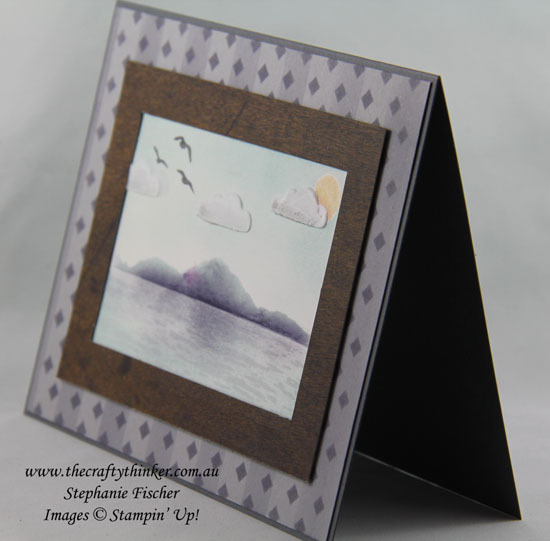 Masked & sponged masculine card - maybe a Bon Voyage card for someone going on a cruise! I also rescued the masks and added some Wisteria Wonder and Elegant Eggplant to my mountains. 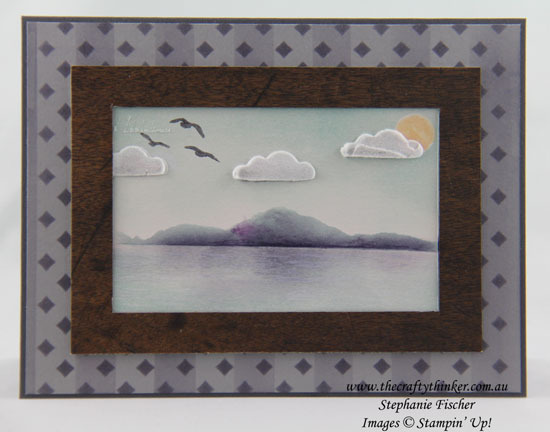 I decided to make a seascape so I added some Soft Sky, Wisteria Wonder and a touch of Elegant Eggplant to the sea before using the wave image from High Tide to stamp watery highlights with Whisper White Craft ink. I used a 1/2" circle punch and post it note to create another little mask for the sun and then sponged the sky with Soft Sky ink. I removed the mask and used one of the Pattern Party masks and Embossing Paste to put some clouds in the sky. Once the clouds were dry, I watercoloured the sun with some So Saffron ink and stamped some birds with Basic Gray ink. I added a touch of Smoky Slate ink to the lower parts of the clouds. For the background paper, I used another of the Pattern Party masks and Wisteria Wonder ink on Smoky Slate cardstock. To calm down the busyness and help the eye to focus, I used some washi tape to mask stripes and lightly sponged with Wisteria Wonder ink. I wanted the frame to sit just slightly proud of the scene to be either an art or window frame so I cut it from Wood Textures Designer Series Paper and then cut a slightly smaller version from some old packaging material that I glued to the underside. I then assembled everything on the Basic Gray card base. The photo below gives a little idea of the dimension added by the frame and the clouds.